The word Triphala means Three Fruits. Triphala is recommended and used more often than any other Ayurvedic herbal formulation. It is popular for its unique ability to gently cleanse and detoxify the system while simultaneously replenishing and nourishing it. It is considered one of the best nutritive tonics, and it clears the body of Ama, which is the sticky damp residue in the body that Ayurveda says is the root cause of illness. Ama arises from incomplete digestion, being residues not properly burned up in the internal fires. Ama is the opposite force to Agni, which is the name given to the various internal fires which maintain health. The main agni is the digestive fire, and most imbalance arises within us when that digestive fire is weak. 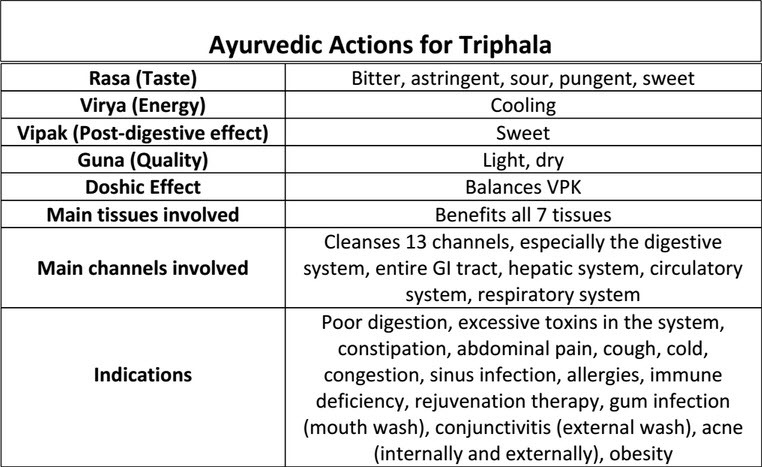 Triphala is a tonic said to fire up Agni, and remove Ama. The three fruits are Amalaki (Indian Gooseberry), Haritaki ( the fruits of T. chebula) and Bibhitaki ( the fruits of T. bellerica). Amalaki (emblica officinalis) is an Ayurvedic treasure in itself and widely used. This little baby, the Indian gooseberry, has been one of Ayurveda’s prized rejuvenators since ancient times. It’s been shown to help lower cholesterol and is loaded with vitamin C. While appropriate for all doshas it’s particularly effective for balancing Pitta. Haritaki (terminalia chebula) is known as the Tibetan “king of medicine.” Many depictions of the healing Buddha show him extending a handful of this fruit indicating its longstanding medicinal usage in Asia. It’s believed to have a variety of positive health effects on the heart and brain. It can be used as a laxative by itself, but also has an anti-diarrheal treatment. It’s an anti-inflammatory and is calming to Vata. Bibhitaki (terminalia belerica) is another powerful ancient rejuvenator with detoxifying qualities on the blood, muscles, and fatty tissue of the body. Bibhitaki is very useful with conditions involving excess mucous in the system and is also good for quality bone formation. This fruit is known as “the one who keeps away disease” owing its name to the multiple benefits it has on Kapha. ~ Strengthening effect on bones and nerves and deeper tissues. One possible way to use is as an occasional tonic during the year to cleanse the body. It can be taken over longer periods of time, such as for a few months. Dosage is about 500 – 1000 mg daily. The herbal tea would be the best way to take it but the taste is very unpleasant (to some), so tablets work more easily. Start at a lower dose, and decrease from higher dose if effects are too strong.Usually recommended to be taken at bedtime. Triphala is considered the foremost of Rasayanas in Ayurvedic medicine. A rasayana was considered a highly nutritional herbal tonic revered for its ability to build strength and vitality, and promote longevity.